(Lanka e News -15.Oct.2018, 4.55AM) It was splashed across the front pages of Weekend newspapers that IGP Poojitha Jayasundara who was the first to be appointed impartially by the Constitutional Council of the good governance government is resigning next week. However we reveal taking full responsibility that this is only another of president Pallewatte Gamarala’s figment of imagination and ‘invention’.. These media coolies living on the crumbs falling from the kitchen table at Paget road who reported this had acted with such irresponsibility that they have not taken even the simple step of inquiring from the IGP or police media spokesman in this connection. It is well to recall the presently embattled president who has another 50 weeks or so to remain in office once said , ‘if I am going I will set everything on fire’. It is in fulfillment of that threat the president while remaining as the head of the government is creating unnecessary issues for the government which were in fact hitherto non existent . Once , he told a story about his own prime minister’s resignation. Then he brought a no confidence motion against him. Thereafter he said , the government is facing an economic predicament. Not enough , he told another lie that there is a conspiracy to murder him hiring his own informant who is receiving a salary from him. Another time he revealed he is going to form a temporary government, and on that excuse he had secret discussions with the rejected ace confirmed rogues who are absolutely against good governance government . Now his latest ploy in the series of lies and deceits is the fairy tale that the IGP is going to resign . In these circumstances the ruling UNF government deserves a special award for putting up with such a crazy and cranky head of the government who had been a headless imbecile from the very inception . The latest craze of the president to oust the IGP must be revealed to the readers.. 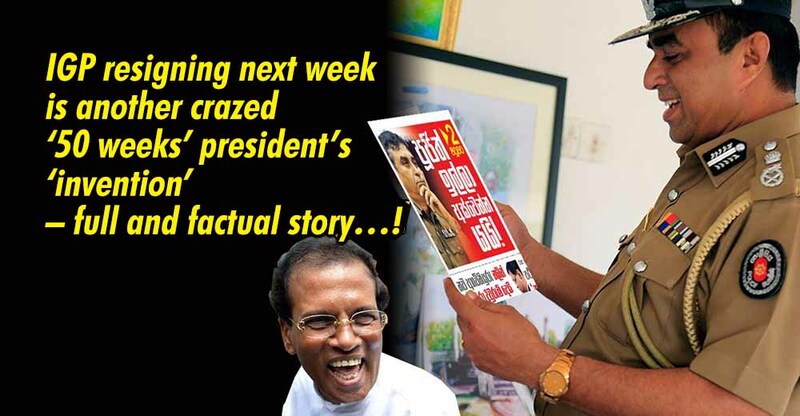 The president returned from New York with the plan to arrest P.M. immediately and make people discarded confirmed rogue Mahinda Rajapakse (MR) the P.M. Part of that diabolic plan was to feed the story in the meanwhile that the P.M. was involved in the conspiracy , and to use Gamarala’s closest media coolies as well as the confirmed crooks Gammanpilas and Weerawansas of the Alliance to achieve that end. Based on the promise made to MR who swallowed it wholesale even without butter , MR instructed P.B. Jayasundara to prepare the next budget. P.B. who reeled under the shock immediately informed Basil who was in America. He had told, at this juncture if the government is taken over let alone preparing the budget , it would not be possible to run the government even to the extent Ranil can without imposing tax burdens . P.B. has explained in case that happens, owing to the unpopularity of the government , even before actually going for elections and forming a government , that opportunity would be at their doorstep. Not only P.B. even Cabraal has opposed the preparation of the budget. Basil who understood the gravity of the situation in SL terminated his holiday prematurely and returned to the country . He then slowly relieved MR of the deadly rope he had swallowed . Meanwhile the president who returned from New York began having secret discussions with Rajapakses when the P.M. was out of the country. These underhand maneuvers were revealed to the media by MR himself which plunged the president into deep embarrassment. MR after holding discussions with the president had quietly withdrawn from further discussions saying , the conditions shall be discussed with Basil. But now the president is in a deep dilemma unable to digest the conditions stipulated by Basil . The latter during an interview with a weekend newspaper today (14) had admitted that he met the president for the first time and did discuss. When the president was asked how he is going to make MR the P.M. during the discussions , he gave the answer, by explaining how Ranil was made the P.M. on 2018-01-08 when they were the minority . However when it was pointed out that is impossible under the 19 th amendment , the president had told Rajapakses , that can be resolved by seeking Supreme court intervention . Besides , by that time Priyasad Dep would have retired , and after appointing a CJ who is pro president he can secure a judgment in his favor, president had assured. In any event those had one impediment : The most important IGP remaining independent and impartial. It is now known that the IGP did not render any support to the attempt to arrest P.M.
By now the ‘assassination of president’ conspiracy has come to a close. In this situation , the president having no option, is from Paget road residence now ‘inventing’ methods to create the necessary public opinion and climate to make the IGP to tender his resignation next week. If president Gamarala is to cheat in the political game he must be a shrewd strategist or at least be intelligent .A lunatic can only screw up a screw loose Manjamala .Hence the writer wishes to conclude this article with one guarantee that the subterfuges and camouflages of Gamarala the loony from the loony bin however planned will finally end up in the loony bin or the garbage bin from where he originated.